This how to cook a spaghetti squash guide is an easy way to learn how to properly bake spaghetti squash! It is a simple process with only a few steps and can be done in less than an hour. Set up a baking sheet with either parchment paper or aluminum foil. 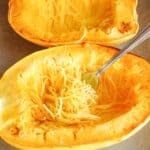 Take your clean spaghetti squash and cook it in the microwave for 4 minutes. It will help to soften the spaghetti squash so that it is easier to cut in half. Cut the spaghetti squash in half length wise, so that you are left with two long boats. Drizzle the boats with olive oil and using your hand, brush it over the entire cavity of the boat. Flip them over, face side down, on the parchment paper lined baking sheet. Bake in oven for 40-45 minutes depending on size. You can tell when it is ready when the skin is soft to touch and you can pierce a fork through it. Once it is baked, take out of the oven and carefully flip them over after 5 minutes so the steam can escape, this prevents the squash from getting too soggy. Once cooled enough (about 30 minutes), using a spoon, scoop seeds out of center of squash and discard or save seeds for roasting. Using a fork, pull the squash flesh away from the peel in spaghetti like strands. Use your fork to pull in the same direction of the strands in order to get the longest spaghetti like noodles. Serve immediately! Or stuff your boats after loosening the strands.